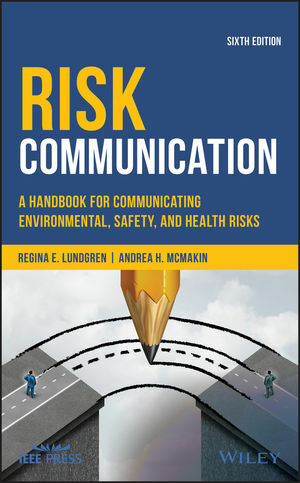 I'm best known for my risk communication book, which was originally published in 1994. Communications specialist Andrea McMakin joined me for the second and subsequent editions, beginning in 1998. The book is now in its sixth edition from John Wiley and Sons through the Institute for Electrical and Electronics Engineers. + Bley, D. C., J. G. Droppo, V. A. Eremenko, and R. E. Lundgren. 2003. Risk Methodologies for Technological Legacies. Kluwer Academic Publishers, NATO Science Series Vol. 18, Dordrecht, The Netherlands. + Quadrel, M. J., and R. E. Lundgren. 2000. "Managing an Effective Vadose Zone Program," Chapter 2 of Vadose Zone Science and Technology Solutions, ed. Brian B. Looney and Ronald W. Falta, Battelle Press, Columbus, Ohio. + Gephart, R. E., and R. E. Lundgren. 1999. Hanford Tank Cleanup: A Guide to Understanding the Technical Issues. Battelle Press, Columbus, Ohio. + McMakin, A. H., E. L. Malone, and R. E. Lundgren. 2002. "Motivating Residents to Conserve Energy Without Financial Incentives." Environmental and Behavior November 2002. + Lundgren, R. E, and K. M. Manke. 1999. "Coming to Closure: Bridging the Gap Between Stakeholders and Subject Matter Experts to Speed Decontamination and Decommissioning." Technology 6:447-452. + Lundgren, R. E. 1999. "Balance of Power." Invited commentary on risk communication in The Journal of Computer Documentation. February 1999, 23(1):22-24. + Woodruff, R. K., R. W. Hanf, and R. E. Lundgren, eds. 1993. Hanford Site Environmental Report for Calendar Year 1992. PNL-8682, Pacific Northwest Laboratory, Richland, Washington. + Woodruff, R. K., R. W. Hanf, and R. E. Lundgren, eds. 1992. Hanford Site Environmental Report for Calendar Year 1991. PNL-8148, Pacific Northwest Laboratory, Richland, Washington. + Woodruff, R. K., R. W. Hanf, M. G. Hefty, and R. E. Lundgren, eds. 1991. Hanford Site Environmental Report for Calendar Year 1990. PNL-7930, Pacific Northwest Laboratory, Richland, Washington. + Smith, R. M., D. J. Bates, and R. E. Lundgren, eds. 1990. Resource Conservation and Recovery Act Ground-Water Monitoring Projects for Hanford Facilities: Progress Report for the Period October 1 to December 30, 1989. PNL-7306, Vol. 1 and 2, Pacific Northwest Laboratory, Richland, Washington. + Candreia, M. J., and R. E. Lundgren. 2003. "Coordination of a Multi-Agency Leukemia Cluster Investigation." American Public Health Association, 131st Annual Meeting, November 15-19, 2003, San Francisco, California. + Malone, E. L., A. H. McMakin, and R. E. Lundgren. 2000. "Encouraging Energy Efficient Behaviors in Military Housing." National Association of Environmental Professionals, Maine. + Lundgren, R. E. 1999. "From Strategy to Reality: Creating a Risk Communication Plan for Your Situation." Invited presentation to the Pacific Northwest/International Chapter of the Air and Waste Management Association Annual Meeting. + Lundgren, R. E. 1998. "Public Involvement: Answers to Commonly Asked Questions." Invited presentation to the Air and Waste Management Association, Eastern Washington Chapter.